January 2017. The four fastest growing Urbanized Areas (UAs) from 2010 to 2015 were in Texas. McKinney, TX UA led the nation with an increase of 27.5% in total population. View, rank, compare 2010 and 2015 demographic characteristics for UAs using the interactive table below. Urban areas (Urbanized Areas and Urban Clusters) are important for many reasons. More than metros and cities, urban area geography better reflects how the urban and rural population is changing. Both metros and cities can change geographic boundary over the years. Urban areas are based on Census 2010 and unchanging between 2010 and 2020. 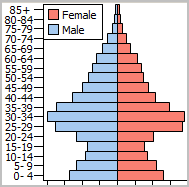 Annual demographic updates are available from the American Community Survey (ACS 2015). This section is focused on tools and analytics to examine all urban areas with particular focus on Urbanized Areas and demographic change between 2010 and 2015. Use the interactive table in this section to view, rank, query urban areas and demographic change for larger urban areas. Use the related GIS tools and data to develop related thematic and relationship maps. 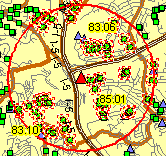 Perform geospatial analysis of geographic and demographic-economic characteristics using the resources we have developed. Gain insights into patterns that might affect you. Use these resources to collaborate on how, where, what, when and why of change. 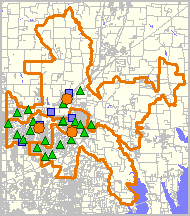 The McKinney, TX UA (bold orange pattern) is shown in context of McKinney city (cross-hatched area) and other urban areas (lighter orange pattern). It is easy to see that some parts of the city are rural and that the UA extends beyond the city in many areas. See more about the McKinney UA and in comparison to other urban areas using the interactive table below. 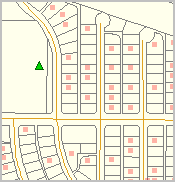 - view created using CVGIS software and related GIS project. Most Urbanized Areas (UAs, 435 of 487) have population 65,000 population or more resulting in the availability of annual demographic-economic estimates. Data are fresher than available for smaller urban areas (ACS 5-year estimates for areas under 65,000). This means more current data to assess more recent characteristics. As annual data are available UAs enabling analysis of change over time. The "2010s" marks the first time these refreshed, time series-like data have been available for urban areas. Businesses and those examining change performing market analysis benefit from the ability to examine characteristics or urban areas in combination with counties and metros. The Houston metro has a bold brown boundary. It is easy to see how the Houston UA (darker orange fill pattern) geographically relates to the metro. 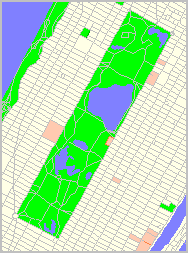 Other urban areas (all) are shown with a lighter orange fill pattern. It is easy to see the urban/pattern character of the general region. While the Houston UA is the largest, there are four UAs that intersect with Houston metro. Use the interactive table below to view their names and characteristics. Urbanized Areas tend to be associated with metropolitan areas having a similar name. 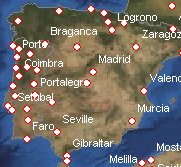 But very often there are multiple UAs within a metro; sometimes one is not dominant. Often there are several UAs in a metro having similar size. Use the interactive table below to view the relationship of UAs and metros (CBSAs). Use the interactive table to view, query, rank, compare selected characteristics of all urban areas. 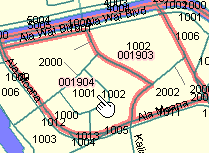 All Census 2010 urban areas are shown in this table.  Negative values (and 0 values in Pop 2015) indicate this data item not available. 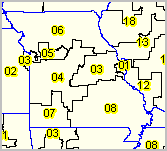  "UA Pop10 in Metro" differs from "Population 2010" only where the UA extends beyond the corresponding metro boundary. 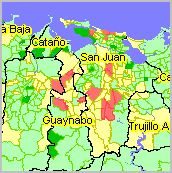  Click UrbanType to select only Urbanized Area or only Urban Cluster. Click Find UA to filter table on UA Name column (case sensitive; uses partial/exact values). Click Find Metro to filter table on Metro Name column (case sensitive; uses partial/exact values).  Click Pop Chg Cols to view Population Change columns. Most of this section is about Urbanized Areas. 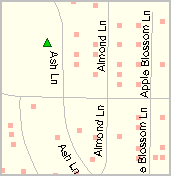 The following graphics show examples of Urban Clusters (orange fill pattern) in context of the corresponding city boundaries (grey cross-hatch pattern). Both views illustrate how rural areas can exist within the city boundary and how urban areas can exist outside the city boundary. 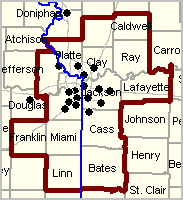 Legally defined city boundaries can update annually. 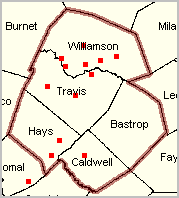 City boundaries shown here are as of January 2016. The urban-rural geographic classification identifies individual urban areas and rural areas. Urban areas are densely developed territory, and encompass residential, commercial, and other non-residential urban land uses. Rural areas encompass all population, housing, and territory not included within an urban area. While cities and census designated places may have an urban character, these areas, like metropolitan areas, often contain rural geography within their boundaries. Likewise, urban areas associated with a city, place or metro may extend outside of that boundary.